At first contemplation it appears to be very simple in design and construction. A mark or stroke that is longer in proportion in its length than its width. Usually generated by hand or machine and applied to a surface it can be thin or wide. Used in a group of more than one it is most commonly used to designate a position or to connect a number of continuous points or denote a measurement of progression. We are taught from the earliest of our years that in their most efficient form a straight one represents the shortest distance between two points and that we are at our best when we color or behave within the confines of more than one of them. Lines can be identified as going up or down, coming before or after, be in, out, over or under depending upon the context of their environment or purpose. Crossing one can be a good or not so good thing. Stepping up to one is often considered courageous or responsible. Being over one may elicit the wrath of others. Having a flat one whether for health of heart or profit indicates a need for serious concern. 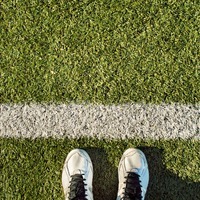 Whether on the field of sport or commerce, a series of these simply constructed lines mark the points of progress towards achieving an ultimate goal. Business managers, coaches and players are sharply focused on the ultimate line of importance, the goal, for it is here that points are awarded and achievement posted for all to see. A well-developed strategy considers the importance of each achievement beginning at the starting line and continuing throughout the journey to the finish line. At Junction Creative Solutions (Junction), we understand the importance of attaining each of these simply constructed marks on a plane of measurement. We are experienced in customizing strategy engagements across business, sales, and marketing to achieve a comprehensive plan of growth and achievement, without losing sight of the finish line. What line is your organization on?